GK Dermatology offers Greater Boston Microneedling procedures. Microneedling is a minimally invasive procedure used for improvement of acne scars, fine lines, skin texture, and pigmentation among others. Microneedling treatment using the Collagen P.IN. device allows for controlled induction of the skin’s self-repair mechanism by creating micro-“injuries” in the skin, which triggers new collagen synthesis. The result is smoother, firmer and younger-looking skin. At GK Dermatology, patients are provided with a post-procedure regimen that enhances aesthetic results. Microneedling can be easily combined with other minimally invasive procedures such as PRP (platelet-rich plasma) to enhance the cosmetic outcomes. Microneedling utilizes a sterile needle head. It is performed in a safe and precise manner after a topical anesthetic cream is applied. The procedure takes 30-60 minutes depending on the type of required treatment and anatomic site. 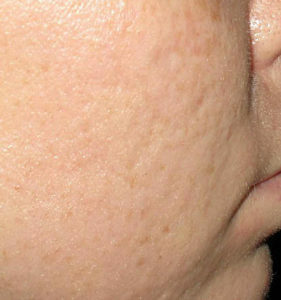 Severe acne scars before and after microneedling. If you would like more information on Greater Boston Micorneedling Procedures, please request a cosmetic consultation (click on online consultation link) to learn more about this procedure.